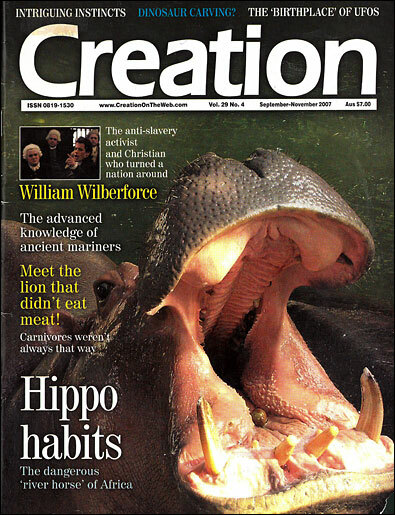 The hippopotamus (‘hippo’ for short) is one of the most imposing and dangerous of God’s animals on earth. Many writers of children’s literature and cartoonists show hippos as buffoonish, overweight misfits of nature, replete with round, flat-topped teeth and wearing tutus and ballerina slippers. 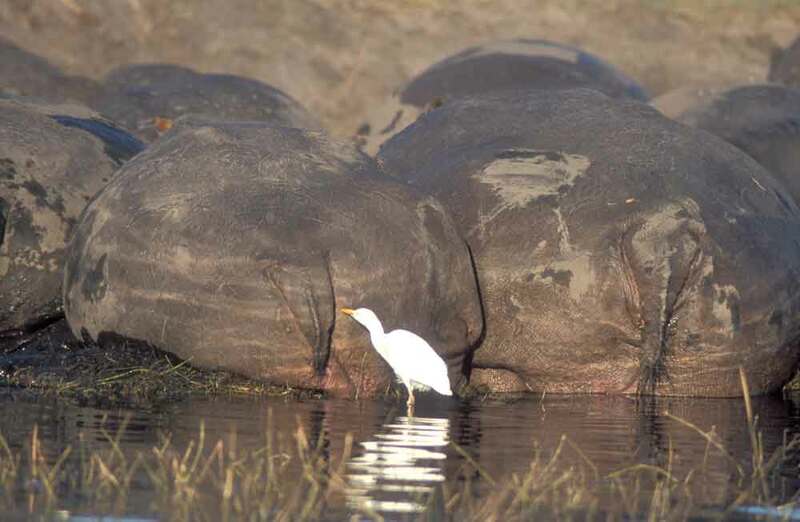 The picture sometimes created is that the only way a hippo could be dangerous is if one sat on you (though this would certainly be unhealthy). 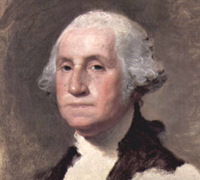 Most people realize that George Washington, the first president of the United States of America, had false teeth. Many think that they were only made of wood. However, in reality he also had artificial teeth made from hippo ivory! Since it doesn’t yellow with age, it was considered a good, natural substitute for natural teeth at the time. Stories of spies and letters, George’s teeth, <www.si.umich.edu/spies/stories-networks-4.html>, 27 July 2006. The hippo now only exists in scattered African nations, though they once populated Europe as well.6 They also undoubtedly once lived in the Middle East, at least temporarily, as they were surely aboard Noah’s Ark, which set down in the mountains of Ararat in Turkey/Armenia. It might also be mentioned that lions once lived in the Middle East, as shown from accounts in the Old Testament and carvings on monuments, although they do not live there today. 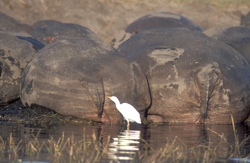 There are two living species of hippo—the Nile hippo and the pygmy hippo. The Nile hippo, considered by many to be the second largest land animal behind the elephant, stands about 1.5 m (5 ft) tall, while the pygmy hippo is only a diminutive 0.75 m (2½ ft) tall.7 The latter only inhabit a tiny part of north-west Africa, in swamps and marshlands, while the Nile hippo exists only in sub-Sahara Africa. Author, Jeffrey, feeding a hippo. Concerning the natural history of the hippo, the One who made them informs us that the unique hippo was created on Day Six of Creation Week, about six thousand years ago. There has been little speciation within the hippo kind in recorded history, so the animal we see today is probably quite near what went on Noah’s Ark and what Adam saw and named at the beginning of creation. No other animal seems to be close to the hippo’s features, causing evolutionary biologists considerable embarrassment at its origins. Incredible as it may seem, evolutionists now consider the closest living relative to the hippo to be cetaceans, or whales!8 A University of Berkeley study in 1985 allegedly showed, using blood proteins and DNA, that whales were more closely related to hippos than any other animal.9 But does similarity prove lineage? If my Volkswagen automobile closely resembles my neighbour’s Audi, does this show that they were made by the same company, or that one is a natural progression from the other? This same study admitted that the findings were not based on fossil evidence, but on speculation and conjecture, guided by the watchful eye of evolutionary dogma. Were evolution really true, millions upon millions of mutations would be needed to transform one basic kind into another. We should be able to see a multitude of ‘gradations’ between a hippo and the whale. But we don’t see this. In fact, if evolution really occurred, there should be so many intermediate forms between basic kinds that one shouldn’t even be able to differentiate between one kind and another. That we do see distinct and separate kinds speaks heavily in favour of creation and divine orchestration. See Steel, A., Could behemoth have been a dinosaur? Journal of Creation 15(2):42–45, 2001, <creation.com/behemoth>. When hippos are out of the water they sometimes appear to be covered in what looks like a thin film of blood, causing some people to think that they ‘sweat’ blood.1 But this is simply a built-in mechanism, designed by God, to protect the hippo. It is a secretion of red and orange colours, which acts as a sun block as well as an antibiotic. 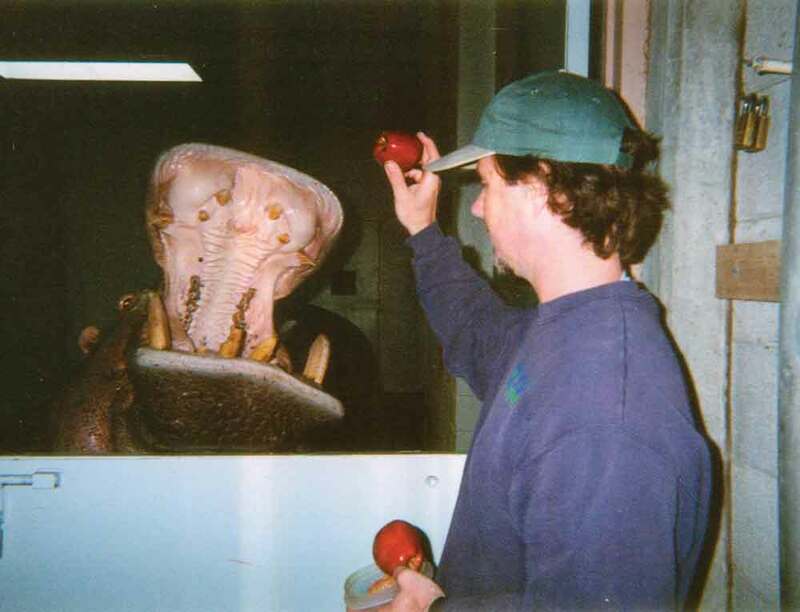 The pigment apparently inhibits the growth of bacteria, which is very useful considering the territorial battles the hippos engage in and how they sometimes incur terrible cuts and wounds from these fights. And when one understands the amount of time they spend in the sun and the often less-than-pure river water, a natural antibiotic and sun-block is a very useful design feature. Hippo’s ‘magic’ sweat explained, <news.bbc.co.uk/1/hi/sci/tech/3749351.stm>, 10 July 2006. See Hippo slime cool and healthy, Creation 27(1):7, 2004, <creation.com/hipposlime>. A 300-kg (650-pound) baby hippo was washed down the Sabaki River (Kenya) into the Indian Ocean. The 26 December 2004 tsunami then washed the orphan ashore where people rescued him. ‘Owen’, as he was named, was taken to Kenya’s Haller Park where he bonded to a giant, male 130-year-old tortoise and the two have been inseparable since. By early 2006, Owen was already much larger than the tortoise, but they were still great friends. Interestingly, Owen tends to be tortoise-like in his food preferences and behaviour, showing just how much of such behaviour is learned from ‘mother’ (or ‘father’ in this case). A lot of the behaviour seen as part of ‘nature-red-in-tooth-and-claw’ may also be learned, rather than instinctive. Roach, J., Hippo and tortoise pals may find three’s a crowd, <news.nationalgeographic.com/news/2006/01/0105_060105_hippo_tortoise.html>. Nile hippopotamus—a heavyweight with clout, <nationalzoo.si.edu/Support/Adopt Species/AnimalInfo/NileHippo/default.cfm>, 10 July 2006. Return to text. The hippo/rhino question or who’s number two? taken from Schwartz, D.M., Smithsonian, XXVI, Snatching scientific secrets from the hippo’s gaping jaws, pp. 90–102, March 1996. Return to text. Welcome to the hippopotamus web page, <www.deanchri.org/zoo/ah/ah.htm>, 10 July 2006. Return to text. The Northern Virginia Daily, Donna Dunn, A Cheetah’s tale, <www.nvdaily.com/NIE/cheetah/chap4.html>, 10 July 2006. Return to text. 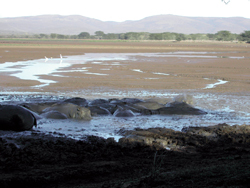 Hippos kill more people than any other animal, <www.didyouknow.cd/animals/hippo.htm>, 10 July 2006. Return to text. Hippopotamus, Wikipedia Encyclopedia, <en.wikipedia.org/wild/Hippopotamus>, 10 July 2006. Return to text. Pygmy hippo, <nationalzoo.si.edu/Animals/AsianElephants/factpygmyhippo.cfm>, 10 July 2006. Return to text. UC Berkeley News, UC Berkeley, French scientists find missing link between the whale and its closest relative, the hippo, <www.berkeley.edu/news/media/releases/ 2005/01/24_hippos.shtml>, 10 July 2006. Return to text. Until recently, evolutionists were equally dogmatic that carnivores called mesonychids were the sister group (‘clade’) to whales. See <creation.com/ambulo#addendum>. Return to text.